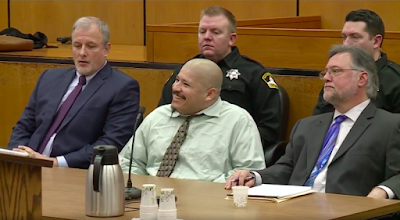 " President Trump Right Again ... "
An undocumented immigrant who admitted to shooting and killing two Northern California police officers in October 2014 said in court on Tuesday that he regrets not killing more cops. Luis Bracamontes, a 37-year-old from Mexico who has entered the United States illegally on multiple occasions, is currently standing trial for the murders of Sacramento sheriff's Deputy Danny Oliver and Placer sheriff's Deputy Michael Davis Jr., according to the Sacramento Bee. The suspect, who has admitted to both murders multiple times, laughed in court as prosecutors described his brutal crime spree, which began in a Motel 6 parking lot and ended after a six-hour chase. "I wish I had killed more of the motherf-----s," he told the court with a smile. "I will break out soon and I will kill more, kill whoever gets in front of me." After briefly removing the jury during the chilling outburst, Judge Steve White warned Bracamontes, "you will not disrupt this trial, you will not speak out. If you do, you will be removed from the courtroom." Bracamontes' attorneys claimed that the outburst was evidence that their client is unfit to stand trial and asked Judge White to reconsider the defendant's mental competency. White ruled that the trial would continue despite Bracamontes' behavior. Bracamontes, who is charged with killing both deputies, shooting a motorist in the head to steal his car and wounding another deputy, could face the death penalty if he is convicted. His 41-year-old wife, Janelle Marquez Monroy, an American citizen, faces life in prison if she is found guilty of assisting him. He has nothing to lose, this is California, not Texas. He can be completely honest. Open borders are great huh? Elect people who support President Trump's agenda. Democrats want more of these people here. what time is the hanging and where do we purchase tickets? He is the exact people President Trump wants to protect America from. TRUMP 2020!!!! President Trump was Sooooo Right! Bad Hombre Trump was talking about! Trump 2020! What does Maxine Waters, Nancy Pelosi and Crying Chuck Schumer have to say? NOT UNDOCUMENTED HE IS ILLEGAL. WHAT PART OF THIS DO LIBERALS NOT UNDERSTAND. He isn’t an “undocumented immigrant”. 1) There is no such thing as an 'undocumented immigrant'. 2) The PROPER term is ILLEGAL immigrant. I am amazed that such a simple concept is so confusing to liberals. Are liberals just plaing stupid or do they liberal writers believe that their liberal readers are that stupid? First of all, lets get away from the politically correct language, he's illegal, not undocumented. This is why we need to get back to our immigration laws, I feel just great about legal immigrants, getting away from the legal process cost two policemen their lives. This story is gut wrenching. Liberals are fighting FOR illegal immigrants and AGAINST our police officers. Where is this country going? Nowhere good if liberals regain control!!!! Where is the outrage from the left? Trump picks a green M&M over a brown M&M and the liberals shout racism and bloody murder. But two police officers die and liberals are nowhere to be found!!!!!! It's a shame. Liberals want to give illegals like this Sancturary while disarming legal American citizens. Liberals don't know what to think. Insanely wealthy people on camera haven't told them yet! How will sanctuary CA protect this one? Death row for life! Millions on the CA taxpayer! Thank a liberal near you! This clown is not crazy. He just has no respect or fear for the law. Don't send him to prison so the taxpayer feeds him, don't send him to Mexico he will be back. He is beyond rehab so the answer is death. Not in 10 years. The government will shut down because democrats want to protect criminals like this. Look around, people. Illegals before AMERICANS is the liberal way. California, he’ll probably get illegal possession of a firearm. This is who your politicians are fighting for. VOTE! It's the only way we can end this liberal madness! 2018 is coming soon! Death row, 308 million tax dollars per CA inmate! And liberals want you to believe America profits? How? Good job Dems & California... where illegals & cop killers are welcomed & worshiped by the government. Two Cops ,one illegal , proud trespassing Alien murderer!Sounds like California or Chicago! You Democratic Communists are going to pay for your treason! It's coming! Sorry you spelled "ILLEGAL"wrong in the headline again. Maybe you could fix the issue you have with telling the truth.
" could face the death penalty if he is convicted." The guy admits to killings and wants to kill more. There should not be and "if he is convicted". This illegal needs to be put down. The sooner the better. Too bad the California death penalty is meaningless. Liberals consider this illegal a hero, being that he killed two cops. I wonder how long it will be before Yahoo gets "a call" from someone high in the DNC to explain how this story is not helpful to the "party". Might offer some incentive to take it down. It's how they work. Obama was smart. He gave big title jobs to close relatives of media bosses. For example Ben Rhodes, the guy who bragged about lying to reporters is the brother of David Rhodes, CBS News president. Elizabeth Sherwood is the sister of Ben Sherwood, ABC News president until a recent promotion. Susan Rice is married to Ian Cameron, ABC News producer. There are lots more. So if the President doesn't like the kind of questions a reporter is asking, someone's brother or husband gets a call, and the problem is solved. CA must protect this man as he is illegal. They must provide him sanctuary from prosecution. CA idiots politicians must proud that they provide sanctuary for illegals.